Myra Maybelle Shirley (Belle Starr). Image available on the Internet and included in accordance with Title 17 U.S.C. Section 107. STARR, MYRA MAYBELLE SHIRLEY (1848–1889). Belle Starr, also known as the "Bandit Queen" and the subject of much speculation in innumerable stories and popular publications, was born Myra Maybelle (or Belle) Shirley on February 5, 1848, on a farm near Carthage, Missouri, one of six children and the only daughter of John and Elizabeth (or Eliza) (Hatfield) Shirley. Within a few years, the Shirleys moved into Carthage, where they were living when the Civil War started. Young May, as the family called her, probably attended Carthage Female Academy and a private school, Cravens, in Carthage. Her father became a prosperous innkeeper and slaveholder. Sympathizers with the southern cause and supporters of Confederate irregulars such as the raider William Clarke Quantrill, the Shirleys were apparently pleased when their oldest son, John (or Bud), joined a squad of bushwhackers in bloody reprisals along the Missouri-Kansas border. Whether his death in this activity influenced Belle Shirley's direction in life, as some have speculated, is not certain. By 1864, after Carthage was burned, the family had migrated to Scyene, Texas, near Dallas. There in July 1866 Cole, Jim, Bob, and John Younger and Jesse James, Missouri outlaws who had ridden with Quantrill, used the Shirley home as a hideout. 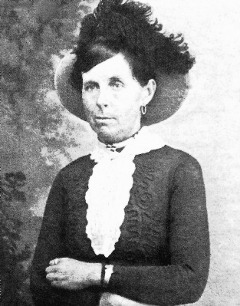 Belle Shirley's relationship with Cole Younger is the subject of many stories, some of which claim that her daughter Rosie Lee, often called Pearl Younger, was his child. He denied it; the likely father was a desperado named Jim Reed, whom Shirley had known in Missouri. She and Reed married on November 1, 1866. Rosie Lee was born in 1868. For a while the Reeds lived in Indian Territory at the home of outlaw Tom Starr, a Cherokee. After Reed was charged with murder, they went to Los Angeles, probably where their son James Edwin (Ed) was born on February 22, 1871. They returned to Texas when Reed's murder charges caught up with him later that year. After their return, Reed became involved with the Younger, James, and Starr gangs, which killed and looted throughout Texas, Arkansas, and Indian Territory. Accounts differ as to Belle Reed's participation in these activities. At least one claims that she disapproved of Reed's actions; more suggest that she operated a livery barn in Dallas where she sold the horses Reed stole. At one point, however, she more than likely moved her children to live with her relatives. There are apparently no records that Belle Reed was ever involved in murder, the robbery of trains, banks, or stagecoaches, or in cattle rustling. Reed robbed the Austin-San Antonio stage in April 1874, and though there is no evidence that Belle Reed participated, she was named as an accessory in the indictment. Jim Reed was killed by a deputy sheriff at Paris, Texas, in August 1874; the story that Belle refused to identify his body in order to prevent the sheriff from claiming the reward is apocryphal. In 1878 Belle Reed appears to have married Bruce Younger, perhaps in Coffeyville, Kansas. If that relationship existed, it soured, and she married Sam Starr in the Cherokee Nation on June 5, 1880. Belle and Sam Starr were later charged with horse stealing, a federal offense, and Belle received two six-month terms at the House of Correction in Detroit, Michigan. After this experience Belle Starr came to be known as the Bandit Queen. In 1886 she was again charged with horse theft. This time, because of her legal skills, she was acquitted, but in the meantime her husband and an Indian policeman had shot each other to death. Belle Starr subsequently took several lovers, including Jim July (or Jim Starr), Blue Duck, Jack Spaniard, and Jim French. She survived all but two of the men she lived with. On February 3, 1889, while Starr was living in the Choctaw Nation, near the Canadian River, an unknown assassin killed her from ambush with a shotgun. Although many killers have been suggested, two men remain the primary suspects in the murder. One, Edgar Watson, could have killed her for threatening to turn him in to authorities for murder. The second was Belle Starr's son, Ed, whom she had recently beaten for mistreating her horse. No one was ever convicted. Belle Starr was largely unknown outside the Cherokee Nation, Dallas, and parts of Arkansas when she died. Soon, however, newspaper reports of her death were picked up by Richard K. Fox, the publisher of the National Police Gazette. When he published Bella Starr, the Bandit Queen, or the Female Jesse James (1889), a twenty-five-cent novel based loosely on her life, the legends began. Belle Starr was buried at Younger's Bend, a remote place on the Canadian River where she often lived. Her daughter later erected a headstone engraved with a bell, a star, and a horse, purchased with earnings she made in a brothel. Ramon F. Adams, Burs Under the Saddle: A Second Look at Books and Histories of the West (Norman: University of Oklahoma Press, 1964). Dinah Helm, "The Bandit Queen," Texas Historian, January 1979. Notable American Women: A Biographical Dictionary (4 vols., Cambridge, Massachusetts: Harvard University Press, 1971–80). Burton Rascoe, Belle Starr: "The Bandit Queen" (New York: Random House, 1941). Glenn Shirley, Belle Starr and Her Times (Norman: University of Oklahoma Press, 1982). Handbook of Texas Online, Leon C. Metz, "STARR, MYRA MAYBELLE SHIRLEY," accessed April 23, 2019, http://www.tshaonline.org/handbook/online/articles/fstbl. Uploaded on June 15, 2010. Modified on April 5, 2016. Published by the Texas State Historical Association.